Precursor Knights | 30mm Madness! Precursor Knights completed! The eyes look a bit ‘big’ with the blue pupils, so I might go back and thin them down… or I might just varnish them up tomorrow and move on to the next model(s). 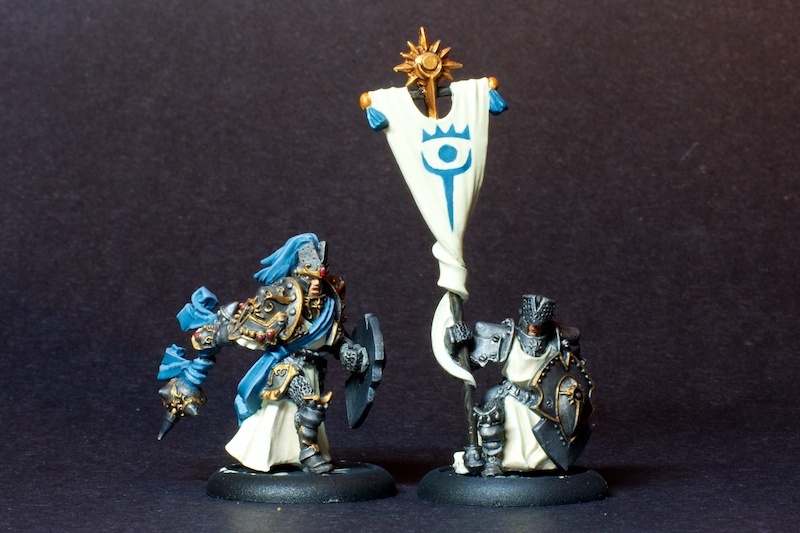 The banner is airbrushed on with a frisket mask, and is the symbol of Morrowan (which is also sculpted into their shields, the figure at the top of the banner, etc). In Iron Kingdom lore, these guys are religious zealots that follow the Morrowan faith, a splinter from the Menites which was the dominate religion. 77 models painted, 41 to go! This entry was posted on April 9, 2011 by justinhardin. It was filed under Unit, WarMachine .